The campaign raising awareness of the dangers of buying drugs online went mobile this week. No, not your phone, but on the side of Alliance Healthcare's pharmacy distribution vehicles. Alliance Healthcare joins a formidable list of long established partners already supporting drug company Pfizer's 'Get Real, Get a Prescription' initiative including the MHF, Medicines and Healthcare products Regulatory Agency (MHRA), the Royal Pharmaceutical Society (RPS), Patients’ Association and HEART UK. The campaign aims to highlight the potential dangers of bypassing the healthcare system to purchase medicines online from unregulated sources. 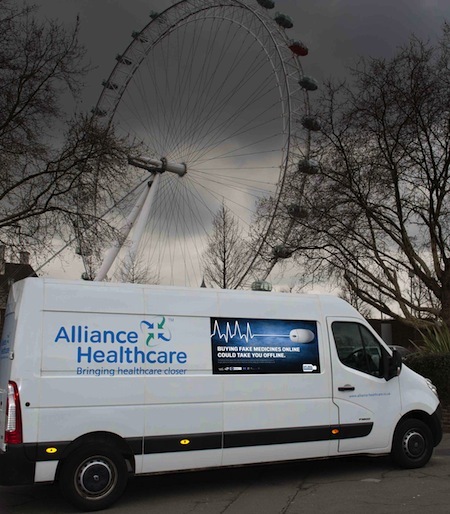 Posters will be displayed on the side of 100 Alliance Healthcare vans for a year from March 2012. They alert Alliance Healthcare customers and the UK public to the potential perils of purchasing prescription-only medicines online, from unregulated sources. The message is that people should always seek advice and support from a pharmacist or GP and purchase medicines from licensed pharmacies rather than turning to unregulated online channels to buy potentially fake medicine. It is estimated by the World Health Organisation that over 50% of medicines purchased over the internet (from illegal sites that conceal their physical address) are counterfeit. In a YouGov survey, more than one in seven British adults surveyed admitted to buying medicines this way and do so because they think they are getting cheaper drugs and faster delivery. In reality, counterfeit medicines can put health and potentially lives at risk. If you want to make purchases online safely, the General Pharmaceutical Council website provides links to legitimate pharmacy sites registered in the UK. If you have any concerns, the Medicines and Healthcare Regulatory Authority (MHRA) is the medicines safety watchdog and has a dedicated 24 hour hotline: 0203 080 6701 or email address. More information on 'Get Real, Get a Prescription'.